There have been some strange side effects of tidying up and trying to keep to a routine. This time it was hemming my jeans. Pretty much every pair of jeans I have ever bought have been too long. So I turn them up and all is good. Rather than waste time sitting about on a break from longarming I thought I would fold laundry. Which meant when I got to folding my jeans I happened to be sitting by a sewing machine. The fold line wasn’t worn out yet, but certainly well on its way so I decided now was the moment to take them up properly. The first pair went so well I did a second while I was there. It took minutes and now I have 2 pairs of jeans that fit. More than that it has just extended their life. 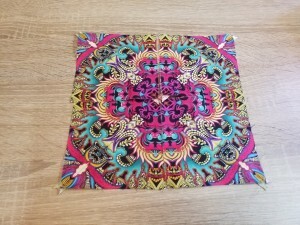 I have a brand new bit of fabric at the hem to wear out now. I can’t believe it has taken so many years for me to do this. These are the possible layouts of my next units. The whole block will have some of both in it I just have to decide which I want more of. I think this is a specially good unit, either option is great. I think I will go with the first option as the main design. I also reserve the right to change my mind. Having trouble scanning more books/cds for some reason I keep losing connection. I can’t be sure if there is an issue with my signal or their system but it is annoying and slowing up the process badly. First time in a long time first day back teaching after a holiday didn’t wear me out. In fact I came home feeling inspired and got the rest of the store rooms items back in it. I had the window in there replaced as well but it is less exciting to work on than the sewing room. Sometimes teaching is hard but often students can teach me as much as I can teach them and yes, some days they can really inspire me. I have to admit I was worried. I seem to have a lot of boxes of stuff that need to go back into my sewing room. However the first 2 boxes vanished very neatly and seem to have taken up far less space unpacked than packed. Maybe, just maybe, it will be OK. I didn’t like packing the stuff into boxes, I have watched a lot of decluttering people who all say putting stuff in boxes is a risky step. Out of sight out of mind I think. That and you get used to the boxes and eventually can’t see them. However I couldn’t see anyway to empty the room for the window fitters and store all the stuff, sooo boxes. They were quite right that decision making it tiring. Sounds daft but after 2 boxes I could tell I was taking longer and making worse decisions. Even at 2 boxes a day it wont take too long so I am not going to push it. 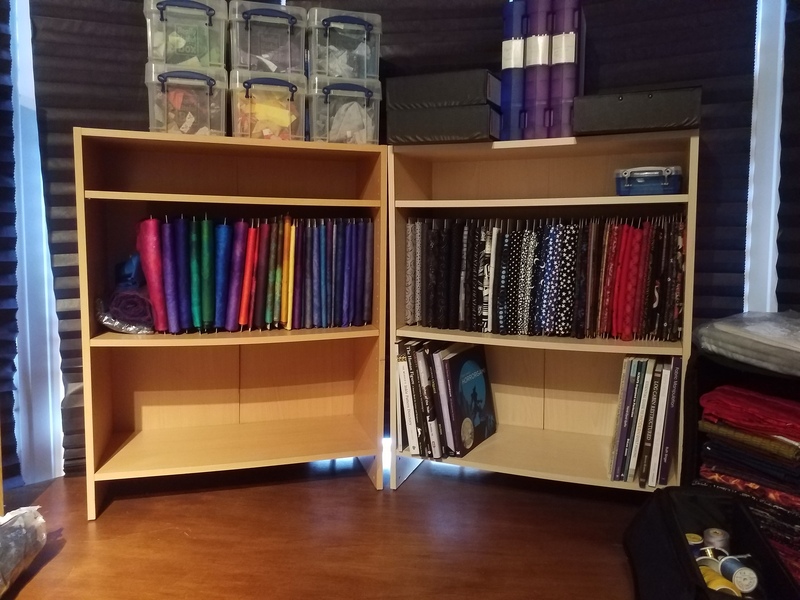 Today I got access to my fabric storage boards so folded a bit more fabric. 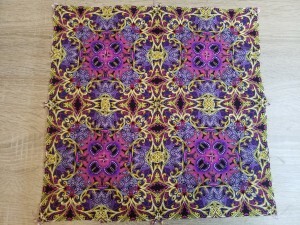 I am wondering about a cover for the hand dyed fabrics, but on the other hand it is so inspiring to be able to see it. I suppose there is no need to decide right away. 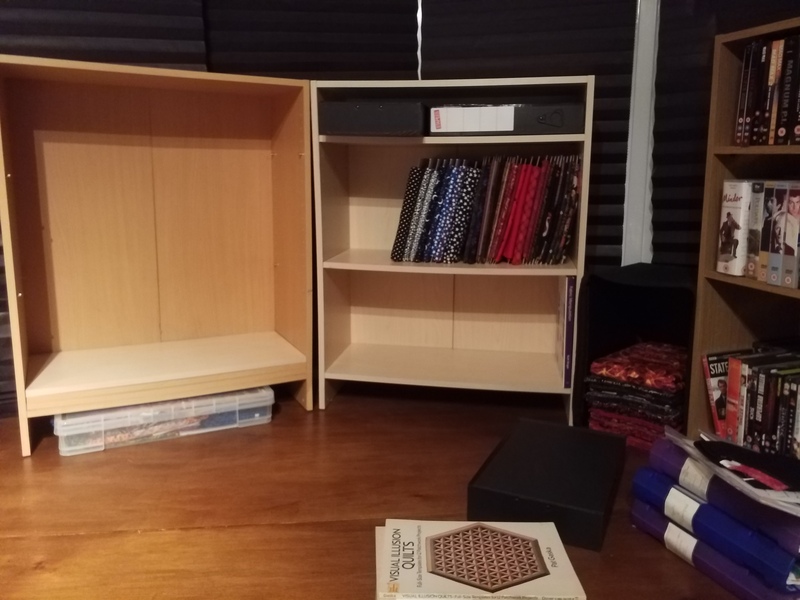 Hopefully the new storage boxes will arive tomorrow, just as well as the desk is starting to collect things that need them. The quilt on the frame and my pieceing are coming along, but right now I think Agents of Shield is calling me. I am sure routine shouldn’t make me feel life is boring but it’s so unusual for me to have any kind of routine I can’t be totally sure. For the moment mornings are devoted to putting the house back in order. Today that got one of my under desk units back in place and 16 books scanned. I found a few missing DVDs in a box that I unpacked, which sounds trivial but it has been bugging me. Knowing stuff is missing is just irritating. The scraps from my quilts are sorted by colour and have homes in Really Useful boxes on top of one of my bookcases. I am slightly worried that everything that came out of the room isn’t going to fit back in. Maybe a second look at things will find me more I can cull. Afternoons are for quilting. The quilt I am currently working on is taking 4 to 5 hours per pass. So I only get to roll to a new section once a day. On the other hand I do get to compete a pass in a day. It is both satisfying and frustrating at the same time. I hope it will be worth the time. Evenings are sit down sewing. My back tends to get upset with me if I stand and quilt all day now so this is a compromise. It is also progressing a lot of projects so I can’t complain. Tonight was another go at the quilt I was doing yesterday. 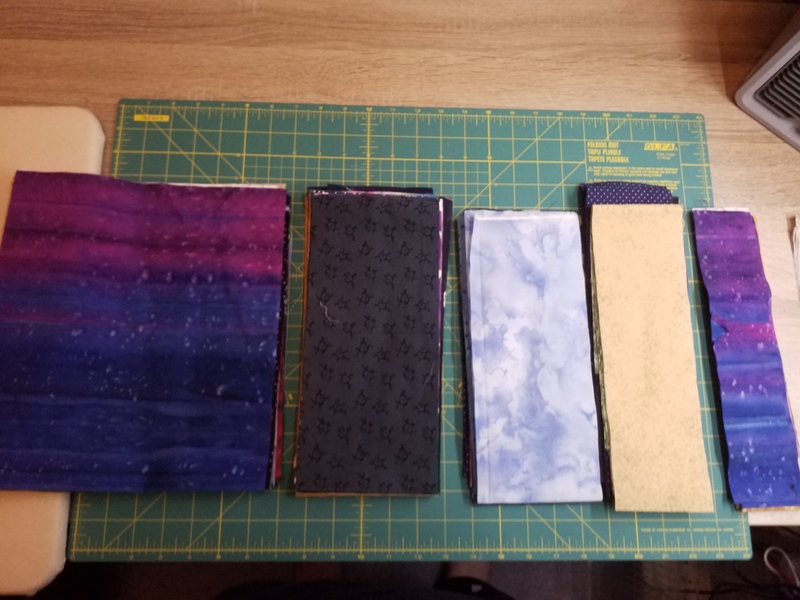 I am so excited by these blocks and if all goes well tomorrow I think I will get another finished. 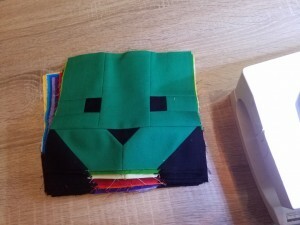 These are the pieces before any sewing. They do look fun, don’t they? I did double check the possible diagonal cuts. I think however I cut this piece it was going to be good. 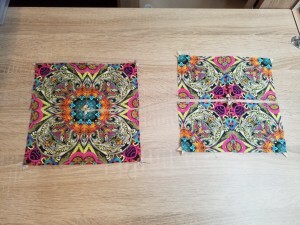 After sewing the triangles together these are the 2 possible blocks. I will pick one version and make 4 units. Then they will all be joined to make one super block. 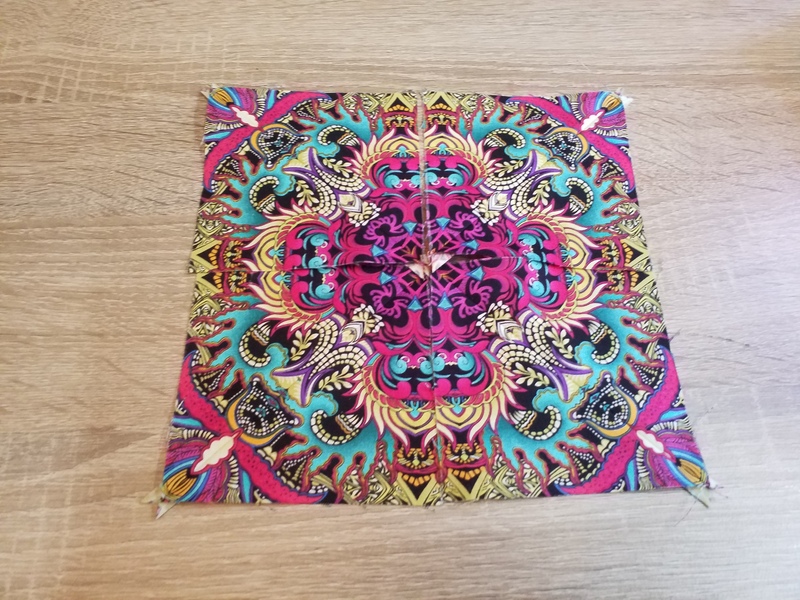 It amazes me how differnent the colouring is when the pieces are all cut from the same fabric. This is the last set I have cut ready so after these blocks we will have some less exciting days of fussy cutting the next pile of pieces. So where did we get to? After couple of slow days I managed some progress today. There is one of my quilts on the frame, that might make it to a show this year. I will try to grab some photos. I have started putting my sewing room back together. To get new windows fitted it had to come apart completely. Which is no small matter as anyone who crafts knows. However the reassembly feels an even bigger job. If I have to do the work I want it done right, so lots of decisions and tryng to find a tidy way to fit too much stuff in too small a space :). The Really Useful Box company had a sale on a few of their boxes which was handy. I wanted to stick with black and grey storage boxes but for that price I can learn to love blue. The bottom shelf will get books. I want to catalogue them as I put them back hence they’re currently sitting on the desk. 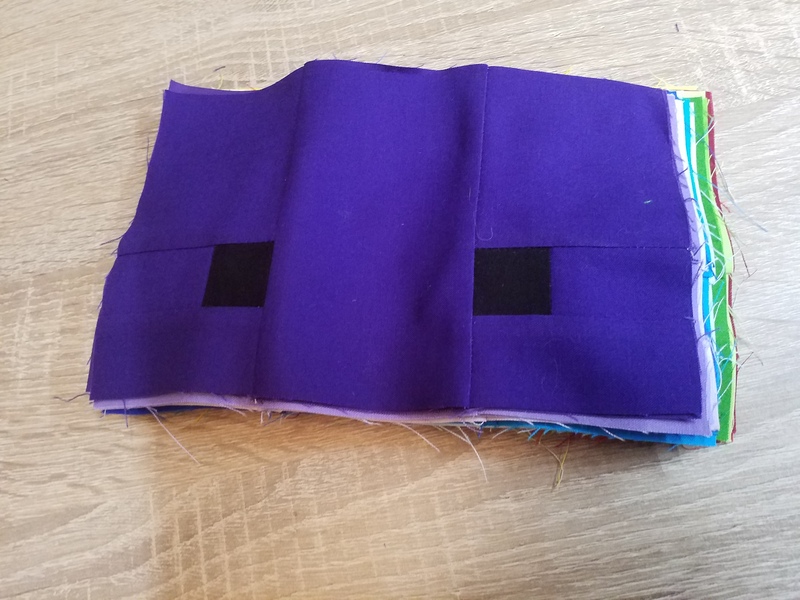 Then a row of mini bolts of fabric. Before you panic, the room is only lit when I am actually in there. Those bookcases are in front of the only window which has blackout blinds on too. Fingers crossed fading won’t be an issue. The gap at the bottom of the shelves is a nice space for a 10l Really Useful Box. I like those for larger projects and it saves junk ending up under there. I hope that my big files and scrapboxes will fit on top of the shelves. 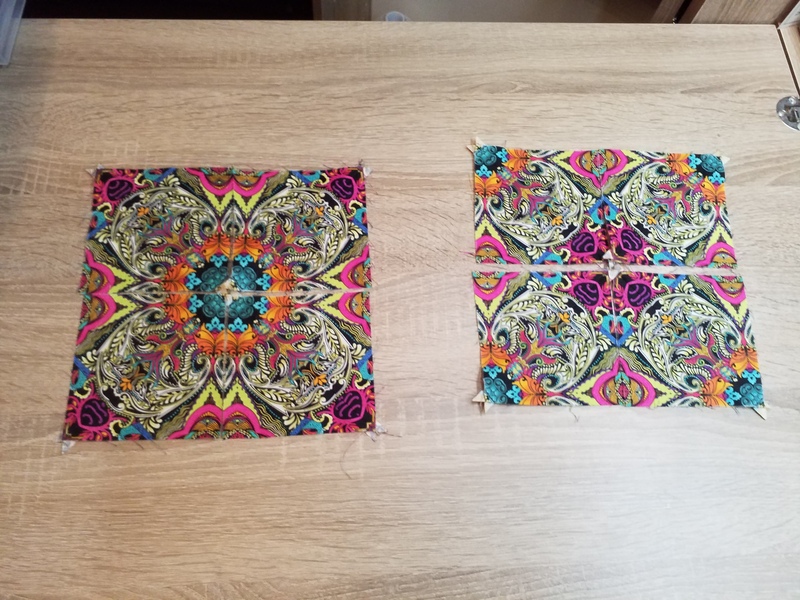 At the moment I am planning both of these to be laid out the same way, but if I don’t need the space for fabric I may end up with more storage boxes there. CD cataloging has progressed, 1047 music discs and 135 audio books. Slow progress maybe but at least it is moving along. Once all the CDs are done I will neeed to get them sorted into alphabetical order that will be a horrible job, but how else can I expect to find anything? The DVDs are already sorted but they need cataloging when I get some of the others done. I am going to have to work out a better way to file the non fiction books. Author is much less useful for them, and some sort of category system will be needed. I really wish I could log on to something online and not find a ton of spam. Today it was here, when I checked my comments. Apparently I need to access a private and personal website, to get a loan for a car, to get more traffic to the site and to learn Russian. Good to know. Where would I be without all these kind people looking out for me? Still as a time of new beginnings I am trying again to get into the swing of blogging regularly. I would love to get some real readers again not just spammers. Last night we tried a different thing for the New year. It was a glorified disco playing power ballads. I realised that I have absolutely got old. I have no idea why I would want to watch a group of DJs prance about a stage whenever they aren’t actually playing music. I appeared to be in the minority. Others seemed to find this a normal and entertaining show, but it left me mostly mystified. There was some good music and having the police make sure you don’t pay on the tube was sure fun. 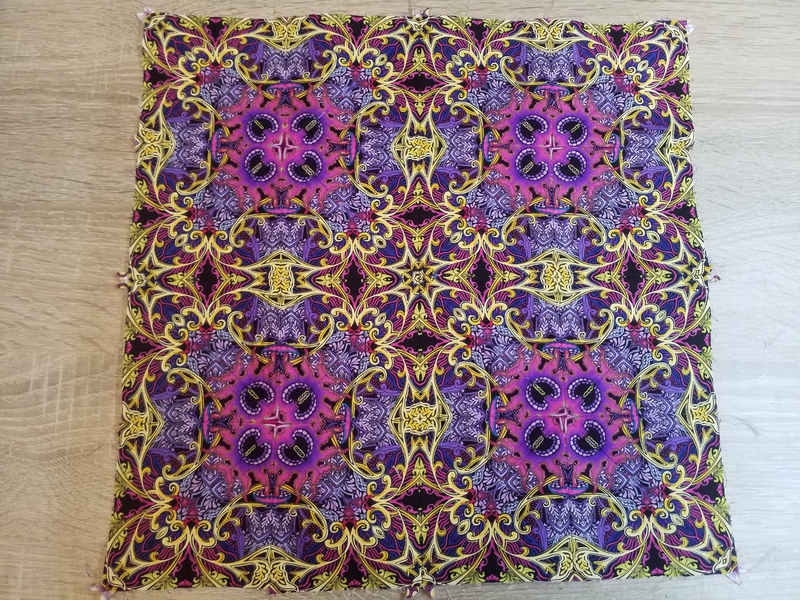 Today has been a slow start, but I did get another block together for my quilt with a lot of symmetery. The worst part of coming back to projects after a few weeks or months (or years…) is finding all your errors. 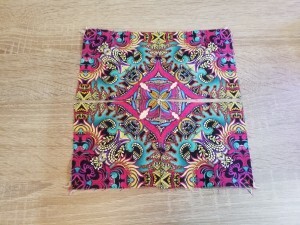 This block was far from the best I have cut but it stitched up OK with some fiddling. My ongoing project this year is cataloguing. I have logged the first 899 of our cds. When they are done I will move on to audio books and DVDs. Yes we still use real pysical media. No I don’t want to swap to all digital. I want to know I can watch what I want when I want. Yup I am worried about DVD players being phased out. I guess I will have to have both a digital and a physical copy. Once I have the small collections done I plan to start on our books. Those will take me a long time I think, but hey it’s a good project to have for the year right? In a bid to help me sort out my sewing space I watched a lot of youtube videos of craft room tours and declutterings. if you just leave youtube runnning it slowly wanders about and eventually it left me watching the Houston Clutter Fairy. Mostly I dislike the decluttering experts. Well to be frank I feel most are utterly insane and delusional. This lady was different. Very pragmatic and non judgemental. I can’t say every word she says works for me, but then she wouldn’t expect it to and a lot of them can help me. She comes back to book people over and over in her videos (nearly as often as paper but thats another story). The clutter fairy is aware book people are not good at getting rid of books. When she works with book people she encourages them to check book by book if they want them. To clear the space to replace my windows i need to empty 4 smallish bookcases. So I figured nothing to lose by trying to dump some books and maybe it would help. I have hundreds for craft/quilting/sewing books. Had you asked me as a mass I would have said i love them all and need them. One by one things are very different. I was aiming to lose about 10%, in fact more like 30% are now boxed up to be sold or donated. It is amazing how many you grow out of and how with a more experienced eye you can see more overlap of information. Also with that many books I have managed to get quite a few duplicates. I won’t manage to empty all the book cases this way, but I will certainly make a massive dent in them. Eeeep where did the holiday go? How is it that plans never survive reality? As you can see I have managed to get in a little sewing for fun. Not as much as I had hoped though. 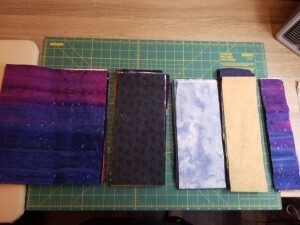 Nor as much longarm quilting, life got in the way rather badly. Still progress has been made on all fronts so I can’t really complain. I managed to get up to the drag strip for one day of the Main Event, and only got slightly singed Not quite sure how I was more burned on the side away from the sun. I guess I must have special talents. I have also managed to get a lot more junk to the tip and I have another pile to head to the charity shops. I seem to be getting better at this cleaning decluttering thing. I did look at a lot of differnt people ideas before settling on these. I have 8 steps becasue the new storage I bought has 8 compartments. 2.5″, 5″ and 10″ are all common precut sizes. 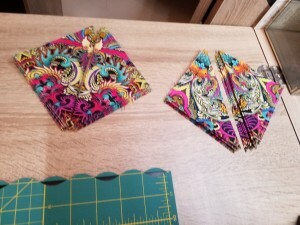 They seemed a good thing to have on hand to let me play with patterns that will work for commercial precuts. Crumbs have been on my to do list a while. I have 2 crumb quilt ideas I am really keen to work on. The specials are mostly Swedens fault. I have lots of metric sets of fabrics from certain ranges. I don’t want to lose any as they are pretty small cuts to start with so they are staying as is until I know what they are going to become. The other sizes are useful numbers that come up fairly often in patterns and will play well with each other. Although I have left them as strips they can easily be cut into squares if I want say half square triangles, or I can go ahead as they are and make log cabins or perhaps asymeteric log cabins. 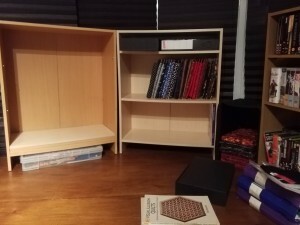 The main thing is it lets me sort my small pieces and store them much more efficiently. The downside of this cunning plan is there is a lot of pressing and cutting to do. I know it will get easier once I clear the backlog, but the backlog may take me a while. It is at least very satisfying.